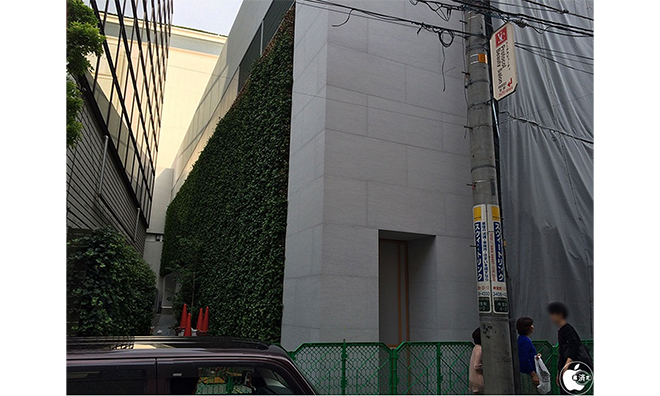 Spotted by Japanese Apple blog Mac Otakara, the upcoming Apple Store in Omotesando is sporting what looks to be a "green curtain" of thick vines that covers at least one entire side of the outlet. A similar installation may be incorporated in other areas of the store's design but are not yet visible due to construction, which is expected to end in June. Prior to the leafy latticework, the location featured an all-glass wall that would have let in large amounts of sunlight, causing an inevitable rise in temperature. With the green curtain Apple may be looking to cut down on power consumption related to cooling down the store during daylight hours. Further, a unique design on the construction barrier, seen below, features a swirl of leaves with the words "Apple Store, Omotesando coming soon." 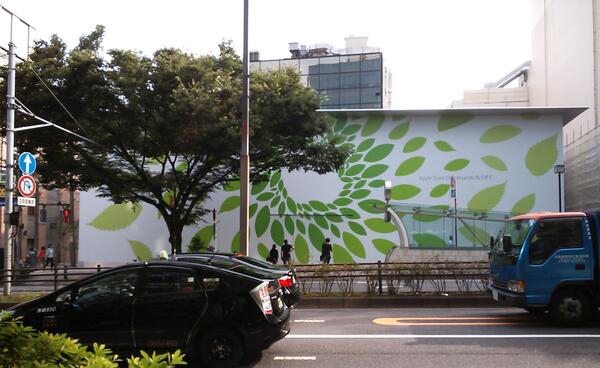 The art is reminiscent of Apple's green leaf iconography used during its Earth Day environmental campaign last month. Apple has been on an environmental crusade as of late. For example, the company's environmental chief Lisa Jackson offered NBC a rare peek into the Maiden, N.C. iCloud data center, which is powered by renewable energy sources. As Apple works toward a greener future it plans to increase sustainable energy installations at both corporate and retail structures, whether it be solar or bio-gas generators like those used at Maiden.